FLOWER FARMER is an exciting adventure into documenting my personal and passionate view of flowers. Within the content you will find soul inspiring words and luscious photographs to delight the mind and the eye - taking you deeper into new perspectives on beauty emanating from the bud. It all begins innocently at my kitchen table. For as long as I can remember, I have been passionate about flowers. They have been a constant source of inspiration to me. It comes as no surprise in one of the only photographs I have of myself as a child, I am lying sleeping next to a glass pitcher filled with flowers already expressing my need for beauty. Not much has changed, as an adult, I remain in awe of the beauty found in flowers. No matter where I am in life I continue to sow flower seeds, nurture flowers, pick flowers, assemble flowers and offer flowers. In many ways I have come to be a Flower Farmer, feeling a responsibility and calling to connect others to the soul nourishing role beauty. I am a Flower Farmer not just because I love to put a shovel to dirt; I have a need to grow beauty with my heart and mind. As an artist I have often found myself offering up the rich connection I feel with flowers in my work. There in the space of creation I begin translating all that I sense into a painting, a drawing, an arrangement, a wall color or something I design or write. The colors, textures, shapes and feelings about flowers translated into a new language. In my work, you will see me, wild about flowers. I have never liked fancy flower arrangements. Forget the florist wire, or the poking of flower stems into foam. I am in love with the sheer joy found in rushing to the garden or field, cutting stems and thoughtfully arranging them in a vase. Keeping it simple, I let the flowers determine the design elements; the shape, the color, the style. This nature filled vessel often transforms the space in a moment, every flower seen for both its strength and its fragile qualities. There it is expressing much about life right from the bud. Above all, I appreciate the way in which a vase of garden phlox can wake up a room, soften the mood and uplift the spirit. Flowers do have a ways of giving us a fresh point of view. For those who love flowers, a room without them is like a room without the lights on. It does not matter how perfect the decor, without the flowers there will always be something missing. A clear glass vase of bright red tulips at the window or a small bundle of fragrant Lily Of The Valley on the bedside table touches us on many levels. Having flowers in a room offers something beyond the physical. For those who truly adore flowers they are a part of the pulse of life. They are always in flux. Even in a vase they are still blooming, petals dropping, colors morphing and then, there is the dying and going to seed again. This is much like other cycles in nature, constantly changing and reminding us that we too are a part of it. We are like flowers. The wonderful American Modernist painter Georgia O'Keeffe, who painted flowers up close and intimately for many years said of flowers, "Still in a way nobody sees a flower really, it is so small we haven't the time and to see takes time like to have a friend takes time." She is telling us to take time to notice the small things. Flowers need to be cherished for all that they are, to be seen up close. Take your time with them, notice them, let them into your life and let their beauty consume you even for a little while. They will help you to live in the present. Eventhough flowers help us to live in the moment they can connect us with the past. In many cultures flowers are a necessary part of the important times in our lives; births, celebrations, tokens of our feelings and funerals. They are without doubt reminders that in all times, beauty is a part of life. There to support us and hold us in all of our emotion, they are partners with our deepest feelings of joy and even sorrow. Their ritual a fundamentally rich part of life. People who love flowers know it does not take many to matter. A few stems in a vase are plenty. Too many flowers and you forget to notice what is important, to see the subtle details. If you love flowers all you need is one type, one color of peony in a glass vase. Or, you might gather a tiny collection of woodland violets and present them in a small vase made of clay, earth to earth. To arrange flowers is a creative process and it becomes personal, like making art. You choose the flowers, the vase, the placing of them, all of these factors create an expression that is unique and yours only. A favorite poet, Mary Oliver captures her time with flowers, "So I put them in the sink, for the cool porcelain was tender, and took out the tattered and cut each stem on a slant, trimmed the black and raggy leaves, and set them all-roses, delphiniums, daisies, iris, lilies, and more whose names I don't know, in bright new water-gave them a bounce upward at the end to let them take their own choice of position, the wheels, the spurs, the little sheds of the buds. It took, to do this, perhaps fifteen minutes. Fifteen minutes of music with nothing playing." Sometimes the potent words of an extraordinary poet can be an insightful way to reflect on our experience with flowers. Have you ever asked the wind to carry your flowers? To stand poised in a open field and let the breezes lift them up, up and away, one-by-one. You offer them freely to the wind Gods - calling out - they be taken wherever it is flowers in the wind go; over the ocean, through the pine forests, past the corn fields, way up into the sky, around the stars and under the moon. Within hours your wind flowers may even come upon another person just like you in a far away place. 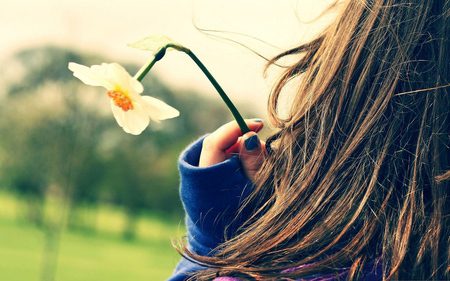 This is a secret you will never know once you open your bare hands to wish the flowers well and let them go. You have no say in the matters of the wind, nothing at all. But, oh - the magic of being left standing in your small feet wondering where-oh-where did my flowers go. There is a child in flowers. Shhhhh...do you see the beacons of sweet child light reflected in petal rays? The joy in the symmetry dappled by kitten love expressing itself through magical circles of plenitude out toward the sun and moon. This child in flowers is the same child that likes to play with the faeries who nurture tiny earthly gifts. Your child and mine does not always see the fairies but they know they are there when they make their wee houses of folded leaves, sticks and stones and gently balance these sacred dwellings on the grass as they call in the crickets. Soon both the fairies and crickets come. They happily sit on the bitty purple velvet sofa in the living room next to the sunny window to be served breakfast tea in tea cups made of campulas. So do forget the plastic child toys when the flowers are bloom. There are butterflies in bright orange gowns along with bees dressed in the finest suits of black and gold. They flutter amid the daisies and dahlias in serious pursuit of the radial magic emanating from the centers of each and every flower humming in small voices, "I love you flowers, I need you for my sweet honey and my life!" and "Thank you! ", in deepest gratitude. Silly thing, I say this too about flowers. 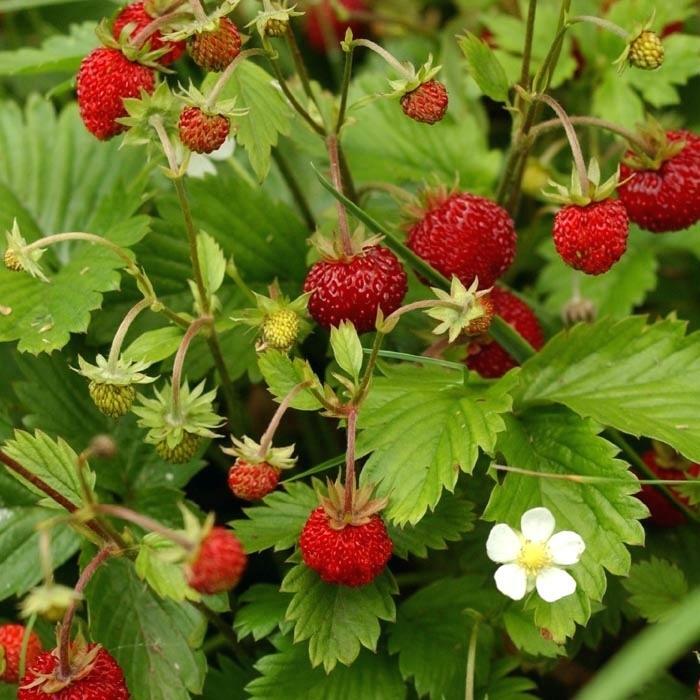 As a child my mother said, "Don't pick the strawberry flowers!" Now that I grow my own strawberries, I understand. It is all I need, one daffodil, to be called a daffodil girl. To happily snip one stem with my fingers and run off into the pasture like a deer. Holding the single daffodil in my hand makes me feel I am part of something more, it and me, alone in the wild. Making my way along the craggy cow path around the bend, I can smell damp black earth from a freshly plowed field over the hill where a farmer has just been with his rickety old John Deer. I hear him, putty-putt, as he moves off into the distance, going toward home to do his morning chores. In the low spot under the bur oak, I stop, a burst of refreshing cool air has come to greet my face. Hello - wild daffodil girl! A field mouse has scampered out from under a leaf. It knows I am there - sensing I am like a fawn moving on the path with my daffodil flying in the wind. I see the ground and also, the sky. I am there in the middle, me, with the daffodil and the small gray mouse, between the earth and sky. Fauvism, it is the period of time in art history I adore most. The Fauvists, 'wild beasts' in French, cared most about expressing emotion through color. They were interested in capturing the essence of their subject rather than the real thing. Their work, fresh air for the soul. I say, if you need more oxygen, you might look to those Fauvists who painted flowers, you will find a profound sense of being alive in their work. I could spend hours with this art and never grow bored. 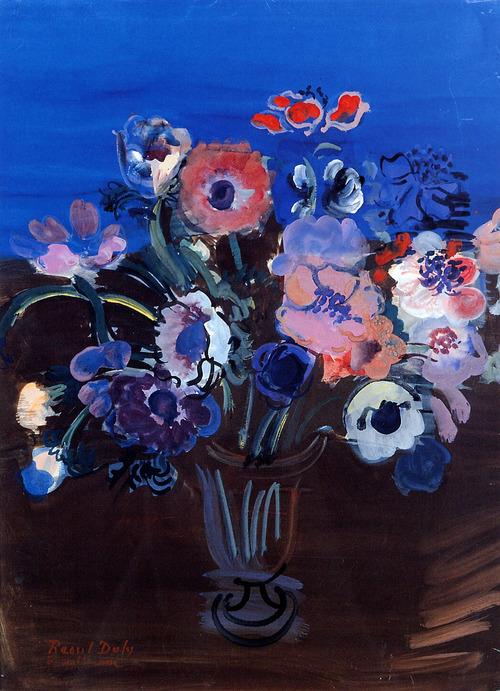 I am madly in love with the flowers of Raoul Dufy, Fauvist painter and textile artist who knew how to share beauty, such joy spilling over from his work into my heart. Much of what he created was done with generous intention, so much so that Raoul said, "What I wish to show when I paint is the way I see things with my eyes and my heart." This abundant offering certainly holds true for me. His extraordinary expression of flowers, thankfully, found way to functional things that brought more beauty into every day life, like textiles. If you cannot have fresh flowers in your presence, please wear them on your dress, hang them in your windows or arrange them as cushions tossed on the sofa. If the patterns are like the work of Raoul Dufy, they will matter in your daily life. These functional things, like real flowers, will be a breath of fresh air in an otherwise stagnant place. This is a small sample of FLOWER FARMER and all the beauty that is to come. If you like what you are seeing and reading, please feel free to send a note on my CONTACT page for comment or additional content information. There are many more beautiful flowers to share. I would love to hear from you.